Applying the perfect lash design to your customer is a pretty time intensive task. So, use this time wisely to create loyal customers! As you spend more time with your customer, work towards developing a relationship with her. You want everyone that comes to your salon to be excited about spending time with you! Make her feel comfortable on your application table. Play soothing music, provide aromatherapy and an ideal room temperature. These small details will help you gain loyalty with your customers. If she prefers to stay awake during applications engage in light and friendly conversation. Get her to talk about herself and take mental notes. Does she have any kids? What are her favorite things? Any big events coming up? Knowing this will help you customize her experience and convert her to a loyal customer. Create new opportunities to talk with your client about what inspires them and apply the feedback you receive to improve future experiences. Integrate eyelash extension compatible products. Choose skincare, makeup and under eye patches based on the conversation you had with your client before her application. By applying the total eye repair serum during the application, you’ll leave your client feeling pampered all while introducing her to an improved regimen. Showcase your personal cosmetology skills using a GlideLiner™ shade that highlights her eyes or the Skin Renewing™ Concealer to make her look refreshed after the application. Addressing her customized needs will build her trust and show her you really care. Keep your clients coming back with before and after pictures of her eyelashes to help her get a better visual of your work. These photos can also assist you in tracking any changes in her natural eyelash criteria. Often times, the natural eyelashes become healthier while wearing Xtreme Lashes eyelashes extensions, which is a great benefit that can be emphasized even more with pictures. Always document and address the changes with your client. This is a great way to gain her trust and loyalty. Every client interaction is important and leaves a lasting impression, so make it a great one! Make sure to check out Part 1 and Part 3 of our Customer Loyalty series and share different tips below that have resonated with your loyal customers! 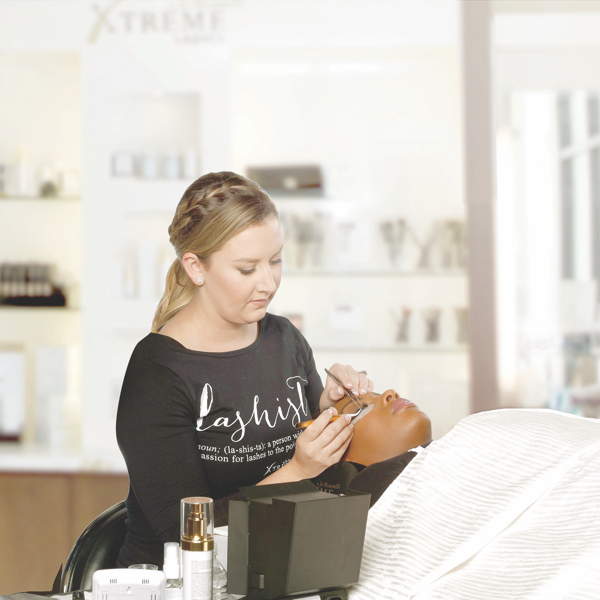 I’ve been in this biz since 2010 and recently became a part of Xtreme Lashes in August 2017. I just wanted to see if I was operating on a Higher Level and I wanted to compare my biz practices with the Best Eye Lash Extension Company. I tralized that I was doing Great and that my own products were great but it took me many years to get there when I could have learned it all upfront by simply investing in myself nand partnering with Xtreme Lashes. My Ladies were already Happy and we always have a Great time together. I use to be a fight attendant with Uniged Airlines so customer service is very important to me because it’s all about the experience. The products are even better than what I had been using. I was nervous to switch products because it took me years to find the great ones I was using. I already was using wrap lashes but mine had a different name. Some of my clients weren’t happy about Xtreme Lashes not having the glossy wrap lashes that I use to use on them BUT they just came out with them before I could even complain. All of this let’s me know that I’m with the RIGHT company. Now I can just focus on my clients and their needs and I don’t feel all alone. Plus it is So WONDERUL to have Beautifully Packaged Priducts to offer. My services and sales have hit record levels thanks to Extreme Lashes. I appreciate all the calls I get from a Lauren who is with the customer support team. She know I LOVE Sales so always makes sure I know when they have specials going on so I can stock up. Ms. Jo Mousselli, I hope you read this because I want to Thank You personally from the bottom of my heart for changing my life and enhancing my business. Your company is a game changer and it’s in a Class by itself. I tell all my clients that your company is the Louis Vuitton of Lashes then I started hearing and reading those same comparisons elsewhere. I hate writing reviews and leaving comments because I always have so much to say especially when it’s something that I’m compassionate about. I was led to leave this comment because I was reading the article about conversations and getting to know your clients…. I’ve alwats done that and it’s so true. I’m so busy working all the time that these ladies have become my true friends and some are even like sisters. I’ve been to their homes for parties or just to visit, hiking, traveling to other states with some of them, written their Pre Need Burial Plans and Life Insurance and just recently I sold a 5 Bedroom house to one of my Ladhistas…. They already Lived me but THANKS to Xtreme Lashes and their AMAZING ADHESIVE the Ultra and their products their trust in me is THRIUGH THE ROOF because they know that I Live to do EVERYTHING and I mean EVERYTHING in Excellence.